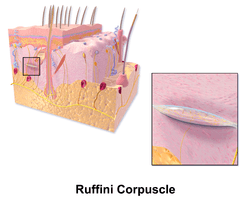 The Bulbous corpuscle or Ruffini ending or Ruffini corpuscle is a slowly adapting mechanoreceptor found in the cutaneous tissue of humans. It is named after Angelo Ruffini. Ruffini corpuscles are enlarged dendritic endings with elongated capsules. This spindle-shaped receptor is sensitive to skin stretch, and contributes to the kinesthetic sense of and control of finger position and movement. In particular they are at the highest density around the fingernails where they are believed to be useful for monitoring slippage of objects along the surface of the skin, allowing modulation of grip on an object. Ruffini corpuscles respond to sustained pressure and show very little adaptation. Ruffinian endings are located in the deep layers of the skin, and register mechanical deformation within joints, more specifically angle change, with a specificity of up to 2.75 degrees, as well as continuous pressure states. They also act as thermoreceptors that respond for a long time, so in case of deep burn there will be no pain as these receptors will be burned off. Classically regarded as a thermoreceptor, the Ruffinian endings/corpuscle is not actually a thermoreceptor but is rather a mechanoreceptor. 1 2 "8". Ganong's Review of Medical Physiology (23rd ed.). TATA McGraw-Hill Lange. p. 150. ISBN 978-0-07-067722-7. ↑ Mountcastle, Vernon C. (2005). The Sensory Hand: Neural Mechanisms of Somatic Sensation. Harvard University Press. p. 34. ↑ Arthur c. Guyton; John E. Hall. "47". Guyton & Hall Pocket Companion to Textbook of Medical Physiology (10 ed.). p. 362. ISBN 81-8147-057-5. ↑ Hamilton, Nancy (2008). Kinesiology: Scientific Basis of Human Motion. McGraw-Hill. pp. 76–7. ↑ Morphology of cutaneous receptors. Springer Berlin Heidelberg. 1972. pp. 3–28. Paré M, Behets C, Cornu O (2003). "Paucity of presumptive ruffini corpuscles in the index finger pad of humans.". J Comp Neurol. 456 (3): 260–6. doi:10.1002/cne.10519. PMID 12528190.